Meritage Homes is hard at work on their first model home in The Legacy at Jordan Lake community in Chapel Hill, Chatham County NC. After many months of little to no construction activity in The Legacy at Jordan Lake, it is nice to see construction begin again. The Legacy at Jordan Lake is a gated community located off Big Woods Rd., near Hwy 64 and Jordan Lake. It's Chapel hill address, stunning gated entrance, impressive waterfall, and 600+ rolling acres, make it one of Chatham County NC's most beautiful communities. 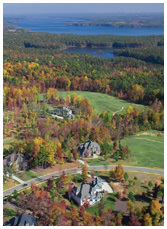 Meritage Homes has recently acquired 90+ lots in The Legacy at Jordan Lake community. Meritage, a phoenix based company, is planning on offering home plans that range from 4,000 to 5,000 square feet, with prices between $400,000 - $500,000. There are still vacant lots for sale in The Legacy at Jordan Lake, on which a buyer could build a fully custom home with the builder of their choice. If you would like more information on The Legacy at Jordan Lake and buying a home with Meritage Homes versus building custom, please give me a call at 919-599-9500. As a local area realtor specializing in Chatham county NC and custom building, I'd be happy to help you navigate the area and make the best real estate investment decision for you! NC Fine Living, specializing in luxury homes in Westfall, Colvard Farms, Chapel Ridge, The Preserve at Jordan Lake, Legacy at Jordan Lake, and many other Chatham County Luxury Home Communities!